This lively guide is all about what’s gone wrong with the planet, what needs to be done about it, and how every little bit helps to solve the problem of climate change, pollution and more. It answers questions such a How can I save energy? and What is a carbon footprint? and there are internet links to find out more, plus a contents page and index for easy reference. This explanation of the environmental problems facing our planet, what has gone wrong and what needs to be done about it, will help older primary and younger secondary pupils to a better understanding of environmental problems. It includes an introduction to the energy crisis, pollution, food and food miles, wildlife in danger, disappearing forests and carbon footprints. There are lots of practical ideas for how pupils can ‘go green’ and support for teachers in engaging pupils about possible futures for our planet. The language is appropriate for key stage 2, the illustrations are interesting and there is a useful glossary. The book is robust and appropriately priced, with 20p from every copy sold going to Friends of the Earth. A good classroom or library reference to get pupils started before carrying out independent research and developing their own responses to environmental issues, it is also a useful addition to primary ESD resources. 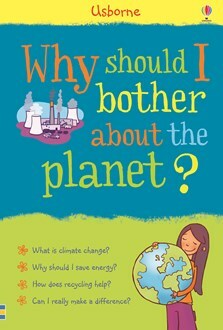 Asks the big questions about global warming and considers how we can all help. The book works best as an informative guide to the main issues. Starting with an easy-to-read potted history, beginning with the industrial revolution, it examines everything from fair trade to biofuels. This book doesn’t shy away from politics either, asking what governments can do about climate change and the threat to our planet. For extra green points, the book is printed on Forest Stewardship Council (FSC) approved paper and 20p from every copy goes to the environmental charity Friends of the Earth.